I like collecting old, leather bound books but sometimes you just can’t find them, they’re not in good condition or they’re incredibly expensive. I’m sure not everyone agrees with me, but I love the Barnes and Noble Leatherbound Editions. The cover art and spines are all so gorgeous that I can’t help but collect them. I was at Barnes and Noble last weekend and noticed that they had the books on sale for $15 and I couldn’t help myself. I walked around debating between Les Miserables and Lovecraft, Norse Mythology and the Snow Queen, Tarzan or John Carter. I was only going to buy one, but my dad offered to buy me one which was super nice of him so I ended up with two new books for my shelf! We also perused the science fiction/fantasy shelves, of course, and he bought me the first book in the Wheel of Time series by Robert Jordan because it was one of his favourites and he thought I’d enjoy it. 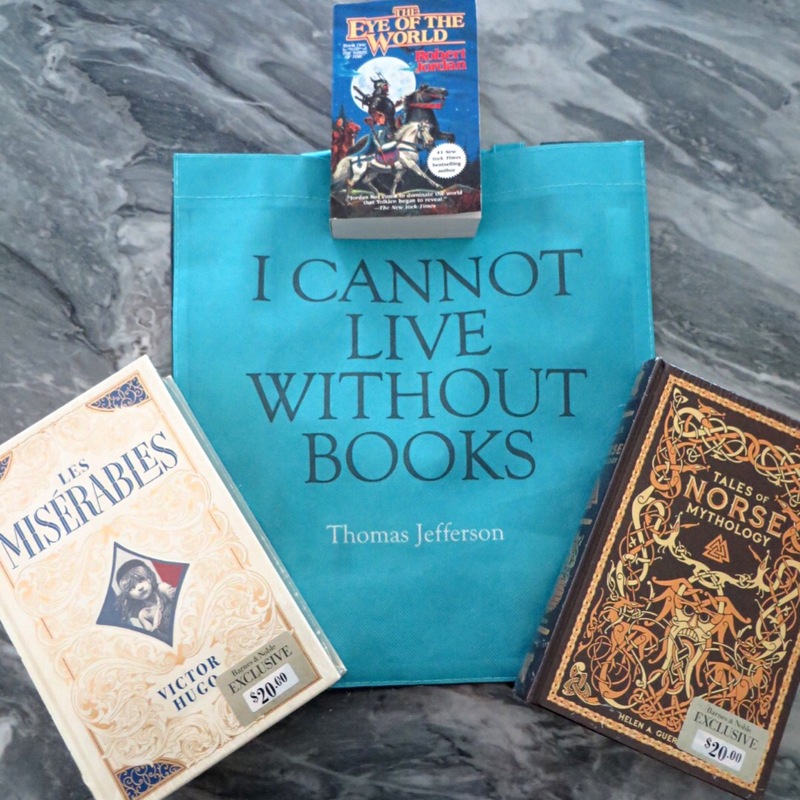 It’s not a big haul, but I’m so happy with my new books (and bag, that quote is perfect)! Oh yeah, I have some of the early ones so they don’t all have the oval part on the cover. Love them all though. I’m glad to hear you do as well! The Arabian Nights book is gorgeous, it’s one of my favourites.